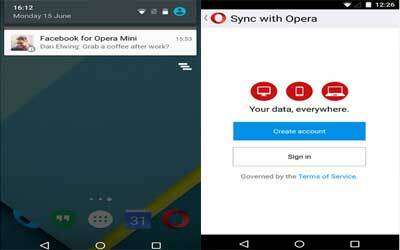 Opera Mini APK 18.0.2254.106542 has been known as the mobile browser hat compress web sites in order to save the data. By using this app, it will allow the small data and let you have the speeds things up as well. For the point plus of the latest version, it has the modern look and feel that can handle your downloads and searches efficiently. Opera mini is also appropriate to you who has 3G signal on your android. Besides, if you are just looking for a way to stretch your data allowance, this mobile browser is the best choice for it. The main menu application is full of neat features. In this feature, you can take a look at popular news stories from all over the website, and then organize your favorite websites as the speed dial. The other feature on the main menu that it has is the super-simple quick and common searches bar. You can choose what you want to search on, whether by using Google, Amazon, Wikipedia, and so on by using the dropdown. Opera Mini also has the features for compress sites to just 10% of the amount of data used by the other mobile browser. There is also the managing tabs feature that looks greater from the latest version. Besides, you can handle your download by its feature of pause and resume. You may do not be worry about your download files when you get the limited access. The newest feature offered is the synchronization features. You can keep synced between some accounts. Opera Mini for android as the longest mobile browser is the best mobile browser that is the fast browser that helps users browse easily in some conditional cases as the advanced mobile browser. Save your favorite sites: Tap the + button on the search bar to save a page to Speed Dial, add it to your mobile bookmarks or read it offline. Get the latest news: Enjoy one-click access to the top stories and freshest content from across the internet. Sync your content: Access your favorite bookmarks, Speed Dials or open tabs across all devices. Night mode: Dim the screen to reduce eye strain. Customize your browser: Tailor Opera Mini with different looks to suit your style. Switch up your search: Choose between different search engines to suit your needs. Manage tabs easily: Opera is designed for ease of use, which means less hassle to get where you want, quickly.